This dress is a composite of the New Look 6735 top and Simplicity Thread’s 3877 dress. The purpose of this dress was for a Sunday morning service at my church. I’m starting a dance ministry there, and in effort to incorporate dance into the services, I’ve been dancing once every four to six weeks. This dress was intended for a song called “The Battle Belongs to the Lord.” I envisioned black and gold for this particular song. Black signifying the darkness of the battle, and gold for the victory. I found both fabrics at a Super Jo-Ann’s in one of the near-by towns. It was a pretty hefty expense. The black spandex was about $12.00/yd. and the gold lame was about $5.00/yd. I believe. Overall, the total was a around $45.00 with coupons. Believe me, this was a good price for this fabric and this type of dress. Typically, dance dresses like this run from $60.00 to $75.00, average. So I did save some money and got to design the dress the way I envisioned it. I cut out the fabric and sewed most of the dress (save the hemming) in 24 hours. Yes, I did a quick job on this, which was only possible because I serge it. However, I machine basted the skirt first, then went back over the seams with a serger. The top was a snap to put together. I cut out the pattern pieces for the 3/4 sleeves and cut the bottom off at the waist line. Then attached it to the skirt. The only thing I needed to fix was the bagginess of the top. When wearing the dress, it looked like I didn’t have any hips, and I wanted the dress to fit more snuggly. So I tried sewing darts into the front. It was more fitted, but messed up the look of the skirt. 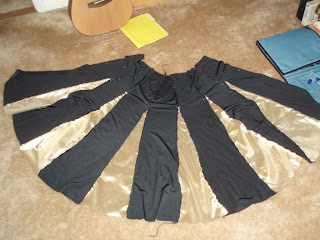 I took out the darts and took in the bodice’s side seams instead. Ironically, I never got a chance to dance in this dress, because service was cancelled due to inclement weather. Well, at least I have it for another occasion when I need it. Jeans Question. What Kind of Fabric? 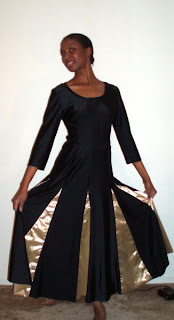 I remember sewing gold lame for praise dresses for church…I had gold lame threads for weeks! 🙂 Your dress is beautiful and will twirl beautifully! Great job! I hope you get to wear it soon! Wonderful job! !My chruch have a praise dancing too.So I know you will get a chance to wear your beautiful dress. Lovely dance outfit. If your church is like mine, you’ll have an opportunity to perform in it sooner than later. My daughter would love to do dance ministry. She once took a lyrical ballet class where the teacher taught to Christian music and loved it. That’s a really great looking dance dress! You’ll wear it sooner or later!